In a previous post, we discussed how the amount you owe others represents 35 percent of your credit score. Another 30 percent of your score is based on your credit history — specifically, how you’ve paid your bills over time. What are the factors in my credit history? 1) Payment History: Your payment history in each of the four credit categories (installment, retail, credit cards and mortgage) is considered. These were discussed in a previous post regarding how total debt affects your credit score. 2) Time: How much time has passed since you were late by more than 30 days on a payment is also considered. If it’s been a long time since you’ve been late on a payment, the punishment to your credit score diminishes. 3) Percentage of Payments: The percentage of payments you’re paying on as agreed to is also a factor. In other words, if you have six credit accounts, and you’re only paying four on time, then you would only be paying as agreed 66 percent of the time. 4) Overdue Accounts: Other factors include if you’ve had any overdue accounts and how long they were overdue, or if they’re currently overdue, how long since the last payment. 5) Public Records: If there are any adverse public records in your history and how many there are can also affect your score. Adverse public records would include bankruptcy or property liens. More than likely, all the above five factors are given equal weight. 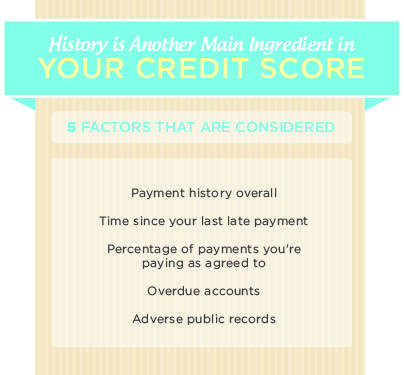 How does history affect my credit score? Any delinquencies in your past will affect your credit score; how severely that delinquency affects your score is dependent upon what the delinquency is from. It stands to reason that being delinquent on a mortgage would have the most pronounced affect on your score. Being 30 days late on your mortgage payment can lower your credit score by more than 100 points and can take over three years for your score to fully recover. If you have a bankruptcy on your credit report, your score will be affected severely, and it will take up to 10 years to clear your report. 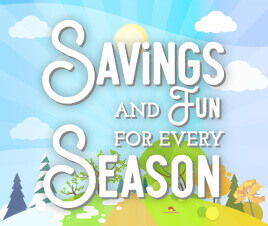 Any other negative items besides bankruptcy can remain on your report and affect your score for up to seven years. Interestingly, your history with utility companies is not listed on your credit report and has no affect on your score. Obviously, having no negative items on your report will help your score the most; the best thing you can do to improve your score is make sure your bills are paid on time. That would be, all of your bills. By the same token, don’t close any accounts for which you have a good history. If you have a credit card you’ve always paid on time and your thinking of paying it off and closing it, you would be wise to reconsider. Paying it off is a great thing, but you would want to keep that one open. Any account with a long, good standing record will only help your credit score. Now that we’ve discussed how 65 percent of your credit score is calculated, next time we’ll talk about the remaining 35 percent. The information in this article is provided for education and informational purposes only, without any express or implied warranty of any kind, including warranties of accuracy, completeness or fitness for any particular purpose. The information in this article is not intended to be and does not constitute financial or any other advice. If you need credit advice, please seek credit counseling. The information in this article is general in nature and is not specific to you the user or anyone else.